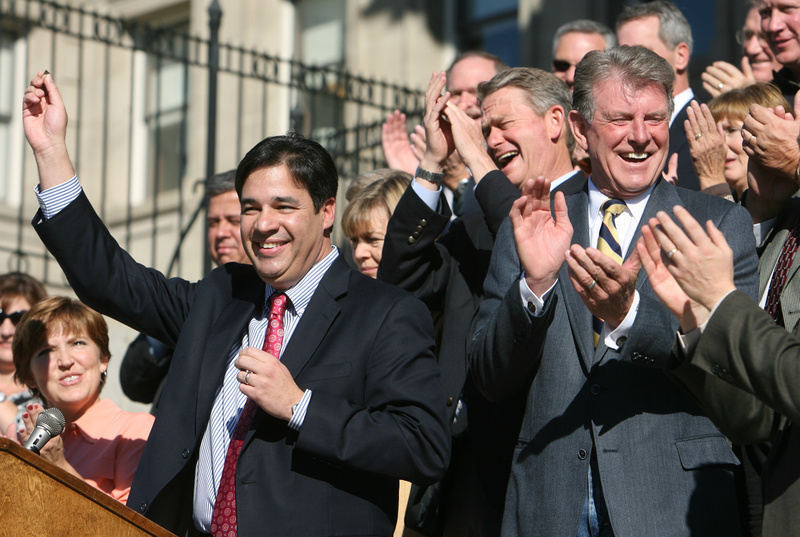 Labrador carries independence to D.C.
WASHINGTON – While speaking to Latino voters in Boise about a decade ago, Raul Labrador caught the eye of Idaho’s highest-ranking Democrat in the state House of Representatives. The audience was captivated by Labrador, an immigration lawyer fluent in Spanish, and former state House Minority Leader Wendy Jaquet recalls pulling the charismatic speaker aside to explore his interest in running for a seat in the Idaho Legislature. “I talked to Raul and asked, ‘Would you be interested in running for office?’ ” Jaquet explained, learning that Labrador already had given it some thought. But when they began talking partisan allegiances and Jaquet’s interest in recruiting him to run as a Democrat, Labrador began to laugh. “No, no, I’m a conservative Republican,” he told her. It wasn’t the first time, nor would it be the last, that the political establishment would be surprised by Labrador, now Idaho’s 1st Congressional District representative. In a seven-year political career, the 45-year-old from Eagle has positioned himself as a resoundingly conservative voice among young Republican lawmakers trying to broaden the GOP’s appeal among voters. With immigration reform as a potential vehicle to do just that, Labrador is combining his political wisdom with a familiar leadership role to try to nudge the party back to its populist conservative roots. Labrador recalls vividly the first time his mother, Ana Pastor, registered to vote. The family moved from their native Puerto Rico to Las Vegas following the 1980 presidential race. After attending Ted Kennedy rallies with the woman he described as “a lifelong Democrat,” Labrador watched his mother register as a Republican. “That, to me, at the age of 13, just seemed significant,” Labrador said. He asked his mother what would make her change her mind so quickly. The woman answered that she wanted to make sure her first vote went to Ronald Reagan’s re-election. Labrador speaks about the former president with a zeal afforded by most young conservatives. The drastic change in allegiance from his mother, who raised Labrador on her own, fuels his reverence. “I found it fascinating, and I thought there must be something special about this Ronald Reagan, that would make my mom – who was a very stubborn, very strong-willed woman – change her mind about something that drastically,” Labrador said. The captivation with Reagan sprouted from his ability to define what conservatism was and speak about the issues as they affect real people, Labrador said. The fascination lingered as he joined the Church of Jesus Christ of Latter-day Saints, earned a degree from Brigham Young University, served a mission in Chile and found himself at the University of Washington studying law. While in law school, Labrador shadowed a friend practicing immigration law. It would become another influence on his political life. When Labrador moved to Idaho with his wife, Rebecca, in 1995, he opened a firm specializing in immigration, spawning offices in Boise and Nampa. Jaquet’s offer came amid a flurry from Republicans for Labrador to throw his hat in the ring. In 2006, he did, defeating Democratic challenger Daniel Weston. Labrador planned to make a splash right away. When the 2007 session began, Jaquet said the “old school” model for young lawmakers was still prevalent in Boise: Freshmen should be seen and not heard. “Raul really kind of broke down that way of thinking,” Jaquet said. In addition to addressing crowds of conservative voters, Labrador helped organize a lunch group of freshman legislators, including current state Sen. Marv Hagedorn and Rep. Brent Crane, to talk taxes and other legislative priorities. “From about the third week, I knew he had bigger and better things ahead of him,” Hagedorn said. Labrador touts his defeat of a fuel tax bump backed by Gov. Butch Otter in 2009 as a consequence of another piece of political advice he received. State Rep. Scott Bedke, now speaker of the Idaho House, told Labrador to pick his battles to win more often. Bedke likened a politician’s sway to bullets in a chamber – you only get five or six chances a year, so make them count. In Washington, D.C., Labrador has used those bullets to shake up a party he says has strayed from its principles and promises to the American people. He split from Idaho’s GOP delegation on the so-called “fiscal cliff” compromise, calling the legislation “worse than no deal at all.” Days later, he raised establishment eyebrows by refusing to vote for House speaker. Fellow Idaho U.S. Rep. Mike Simpson, an ally of House Speaker John Boehner, suggested Labrador had lost credibility after the nonvote, but the two both say they’ve patched things up. “We just have two very strong-willed individuals representing Idaho,” Labrador said. House Republicans went to Williamsburg, Va., later in January to devise a negotiating strategy on fiscal matters. Labrador said the resulting deal, called “the Williamsburg Accords” by some, has given a stronger voice to Republicans concerned about “backroom deals” not vetted by the entire caucus. While Republicans unite in their disdain for President Barack Obama’s fiscal policies, Labrador has emerged as the likeliest GOP broker of a House bargain on immigration reform, in part because he openly embraces changes that some of his colleagues may find hard to stomach. Labrador, for example, calls for reforms that encourage undocumented immigrants to follow the process already in place, rather than create a new “pathway to citizenship.” He advocates an expansion of the nation’s guest worker program and argues that an increase in the visa cap should only occur after objective criteria are met in securing the nation’s borders, including increased fencing and the hiring of more Border Patrol agents. He also wants undocumented immigrants to pay penalties and avoid criminal convictions to remain in the country, but not to round them up and deport them immediately. “This is the golden opportunity, for us as conservatives, to get the enforcement system that we need in the United States,” Labrador said in an address at the Conservative Political Action Conference in February. On Capitol Hill, reporters huddle as he outlines non-negotiable features of any legislation. His answers are swift and matter-of-fact, often delivered with a shrug, a smile or an emphatic wave of the hand. This is Labrador in his element, using the kind of persuasive techniques Idaho lawmakers are familiar with. Labrador speaks for a party eager to make up ground with Hispanic voters. He said he also battles with those, inside his party and out, who don’t understand the extent of the problem. Workweeks often end for Labrador with a flight back to Eagle. He continues to sleep on the floor of his Capitol Hill office. Roots are not something he seems interested in laying down in D.C.
“I don’t see him doing this as a career,” Hagedorn said. Labrador said he’s not thinking about the future, though he notes the long time away from his wife and five children creates the need for sacrifices at home. He described Rebecca as “an angel” for raising the family. The scenery in Washington may be different and the issues more complicated. But Labrador seems right at home politically, flanked by young members of his party interested in appealing to a new generation. “I find myself in a very familiar place, where you’re trying to move the Congress to a more conservative position, but a rational conservative position,” Labrador said. For Labrador, that means a party willing to keep the promises he saw in the party of his youth, the promises that swayed his mother 30 years ago. Kip Hill, a student in the University of Missouri Washington, D.C., Reporting Program, is a correspondent for The Spokesman-Review.